Tuls are credit card sized, multi-purpose tools, flat enough to carry in your wallet, but strong enough to get the job done right. 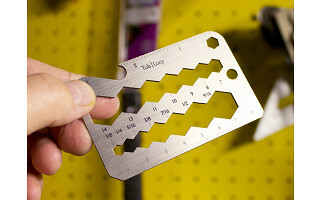 Yes, there are other small multi-function tools on the market, but Tuls has Grommet approval because they are thin as a dime, yet capable of everything from measuring to bolt-tightening, furniture-assembling, bottle-opening, and more. Manufactured in New England, Tuls are the handy creation of the father and son team, Dave & Calvin Laituri. With the philosophy that sometimes the best tool is the one at your fingertips, Tuls are at the ready on everyday occasions when your tool box and work bench are out of reach. The compact, titanium Tuls are made with minimal material, but maximum function. The OLLIE features scales, a protractor, and dual standard gauge. 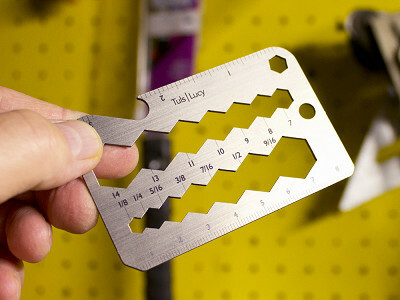 The ROUL precisely measures with both standard and metric rulers, making it ideal for woodworking and crafts. Last but certainly not least, there's the LUCY—perfect for tightening screws, opening bottles, and then some. Onehundred was founded in 2013 by myself and Calvin, my son, with a unique goal: To produce everything exclusively within 100 miles of our Boston HQ. Would love to hear any questions you may have! My self being in the 100 mile radius.. I love the idea... What other products have you created? Dave and Calvin have now launched two products, with a third that has just wrapped up a campaign on Kickstarter. Their other product on the market is Pucs, a set of stainless steel "cubes" that can chill your drink without watering it down. Thanks for asking! On our first project, we re-invented ice with drink-chilling stainless steel 'Pucs' and have just finished launching an aluminum fold-it-yourself bird feeder called 'Brdi'. We're just warming up - there are a lot of interesting talents around here that we can't wait to work with! Do you offer a discounted package f one-of each of however many items you have designed? I love the little birdhouse, and my son would enjoy the titanium tools, I think. Aaron from The Grommet here. That's certainly a great idea and I'll be sure to pass it along to Dave! Onehundred does not currently offer that deal, but something to consider. Tuls are credit card sized, multi-purpose tools, flat enough to carry in your wallet, but strong enough to get the job done right. Yes, there are other small multi-function tools on the market, but Tuls has Grommet approval because they are thin as a dime, yet capable of everything from measuring to bolt-tightening, furniture-assembling, bottle-opening, and more. Manufactured in New England, Tuls are the handy creation of the father and son team, Dave & Calvin Laituri. With the philosophy that sometimes the best tool is the one at your fingertips, Tuls are at the ready on everyday occasions when your tool box and work bench are out of reach.